When you add up all the additional smog from 11 million diesel Volkswagens that cheated emissions tests over the past six years, you get 918,720 tons of extra nitrogen oxide (NOx) pollution. That's what used-car aggregation site Autolist came up with in an analysis, claiming VW's deceit has set air quality back for years. 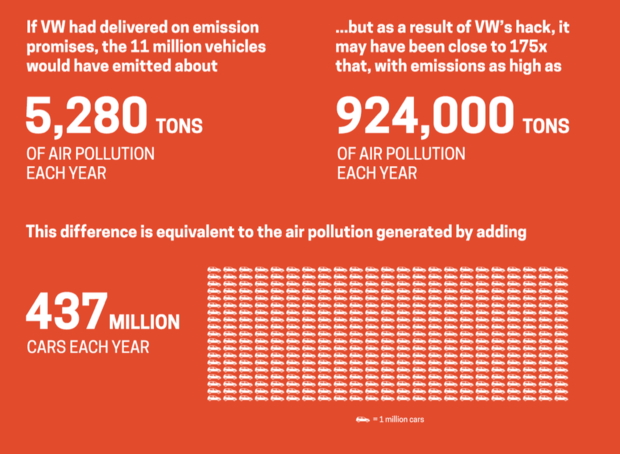 The additional pollution, coming from Volkswagens and Audis that used a "defeat device" to thwart emissions tests, is the equivalent of adding another 437 million cars to the world's roadways; that's nearly twice the 256 million cars in the U.S. today. 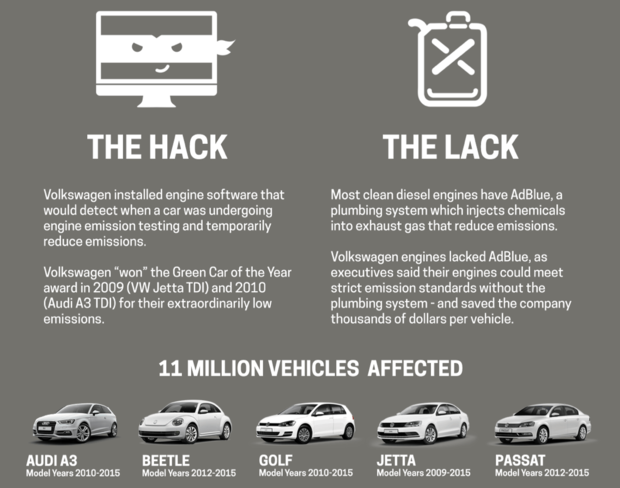 Alex Klein, vice president of data science at Autolist, said he decided to crunch the exhaust numbers after reading one of the many articles on how VW had rigged software in its vehicles to make them appear to have low emissions. He wanted to find out how much extra pollution the vehicles created. According to the U.S. Environmental Protection Agency (EPA), the affected Volkswagens were emitting up to 40 times the legal limit of nitrogen oxide (NOx). "It's pretty insane. This is really, really severe," Klein said. "I was just doing some back of the envelope stuff and thought, 'that can't be. Those numbers are too big.' "
"It really is this bad," he added. "It's no wonder the dialogue now is that this is going to... reshape the auto industry." Klein said he used the U.S. Department of Energy's fuel economy site to determine emissions ratings for all the Volkswagen cars listed by the EPA as having an emissions "defeat device." Along with the EPA, organizations such as the International Council of Clean Transportation, have tested Volkswagen's cars and stated that they emit from 5 and 35 times the emissions limit. Klein used those figures for his calculations. Autolist noted that the first VW equipped with the software defeat device was the 2009 Jetta TDI. When first released in late 2008, the Jetta TDI, which went on to win Green Car of the Year, was one of the first cars to meet the EPA's stricter Tier II, Bin 5 emission standards. 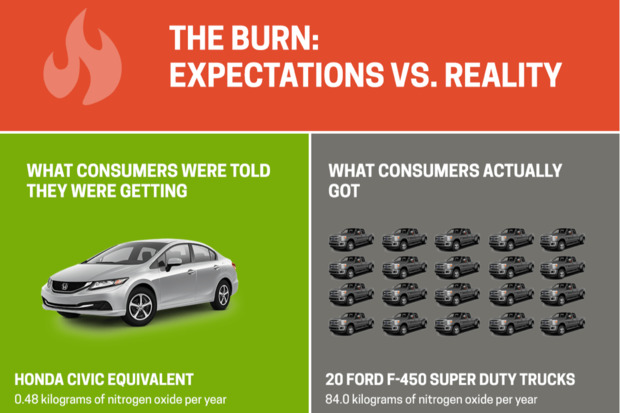 The standards are the equivalent to California's low-emission vehicle standards that limit emissions to .07 grams of nitrogen oxide per mile driven. 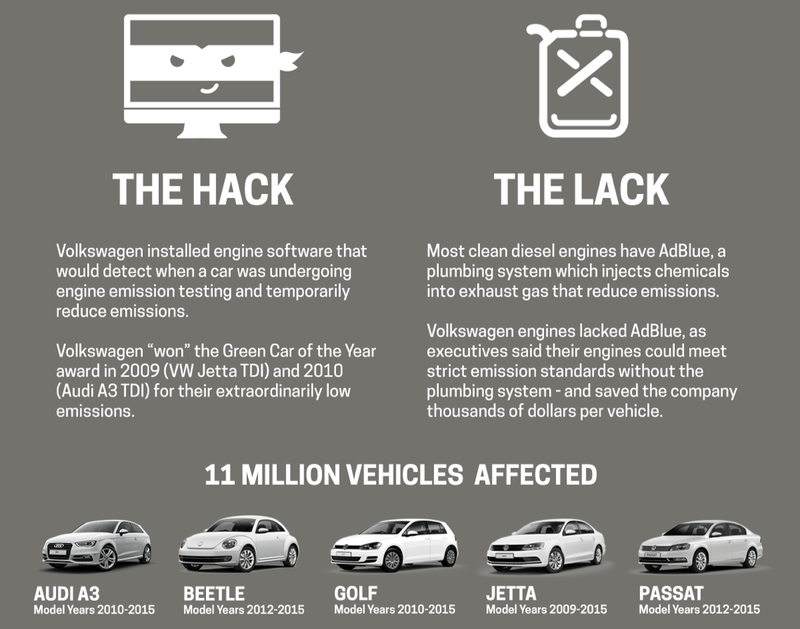 From 2008 through 2015, VW continued to produce the engines it claimed were even cleaner, and they earned emission ratings of .04 grams of nitrogen oxide per mile, much lower than the government's standards. "In reality, the VW cars were producing between 5 and 35 times the legal limit of .2 grams of nitrogen oxide per mile. As compared to their promises to consumers of a 'clean' vehicle, this demonstrates an increase of 175X," Autolist's report states. Based on Autolist’s analysis, the cars were supposed to be emitting NOx gases at levels similar to a Honda Civic, a low emissions gasoline-powered vehicle. In reality, the VWs were producing smog equivalent to 20 Ford F-450 Super Duty trucks -- .084 kilograms of NOx per year. "A Super Duty falls into class 4 trucks. They are between 10,000 to 14,000 pounds, and they are allowed under the law to produce up to .4 grams of NOx per mile. That's 10X the amount a Civic would pollute," Klein said. For example, a Honda Civic being driven 12,000 miles a year would produce .00048 kilograms of NOx, according to Klein. Klein took the .084 kilograms that the VWs were producing per year -- the same as 20 Super Duty trucks -- and the .00048 kilograms a low emissions vehicle should have produced and multiplied both by 11 million vehicles. That resulted in 924,000 metric tons of NOx for 20 trucks and 5,280 metric tons for the low emissions vehicles. He then subtracted the 5,280 tons that VWs should have been producing from the 924,000 tons they were actually producing and came up with 918,720 tons of NOx. "When you replace one Honda Civic with 20 Ford F-450s 11 million times worldwide, the results are cataclysmic," Autolist's report states. "As opposed to producing 5,280 tons of air pollution each year, the car actually produced 924,000 tons each year worldwide. That's a difference of 918,720 tons of extra nitrogen oxide pollution." Klein, who lives in the San Francisco Bay region, said he wrote the analysis because he's an environmentalist who is concerned about climate change and believes the public deserves the truth about the damage VW's deceit has caused. "Being here in the Bay area, my favorite company in the world is Tesla... at intersection of automobiles and green technology," Klein said. "I think climate change is something we're combating."